According to the National Development and Reform Commission’s (NDRC) Report on the Implementation of the 2015 Plan and on the 2016 Draft Plan for National Economic and Social Development, adopted March 16, considerable progress was made in 2015 and reforms were laid out for 2016. 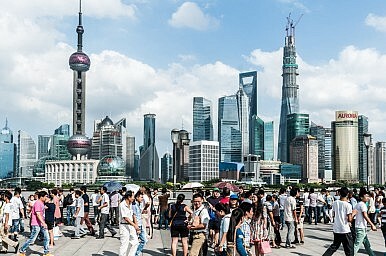 As China’s economy become more complex, planning has become more challenging. In 2015, the government’s focus on major projects such as enhancing tourism, expanding online shopping, and promoting new energy vehicles helped to increase retail sales of consumer goods. Consumption, particularly of services, contributed much more than investment did to GDP. Urbanization rose to 56.1 percent of the population and 13.12 million urban jobs were created. Ten pilot projects for the reform of state owned enterprises (SOEs) were launched, and reforms were carried out in the electricity system, the petroleum and natural gas exploration system, the state forestry farms and forestry regions, water conservancy enterprises, rural supply and marketing cooperatives, and state farms on reclaimed land. Core competitiveness was strengthened within the scope of a three-year action plan for manufacturing industries to encourage technology upgrading and expand the use of robotics. China’s leadership also emphasized entrepreneurship and innovation within the Internet Plus action plan, crowd funding, and technology transfer. Spending on research and development was lower than expected because sluggish growth placed pressure on corporate profits. To promote market mechanisms, non-monopolistic pricing was enforced, and government approval and review was reduced. Most intermediary services for government approval were cancelled. Price controls for 40 goods and services were removed or passed on to lower level governments. Overcapacity was addressed to improve efficiency in the steel, cement, aluminum, and plate glass industries. China implemented policies to expand finance to underserved groups, to impose deposit insurance, and to encourage the internationalization of the RMB. Still, as the NDRC reports, there are many challenges facing China’s economy, including lagging demand, rising costs and declining profitability, and hidden unemployment. Supply-side structural problems, including overcapacity, present barriers to growth. This poses a challenge to ongoing reform in 2016. Going forward, therefore, the NDRC seeks to create more than 10 million new urban jobs this year to address the issue of hidden unemployment, maintain proactive fiscal policy to make up for demand shortages, promote supply-side innovations, and again promote entrepreneurship and innovation. The economy will become more market-based, as government restrictions are reduced and private investments are given equal treatment. Operating costs and the tax burden of businesses are to be reduced. Chinese authorities will continue to promote consumer spending, with target growth in retail sales of consumer goods of 11 percent for 2016. This will be done by increasing the incomes of low and middle-income groups as well as setting industry standards to protect consumers’ rights. New areas of consumption shall be encouraged, particularly in the tourism and technology industries. Reform of the financial system will continue, diversifying financial institutions and stepping up the reform of state-owned banks, as will reform of prices and removing price controls in the power, petroleum, natural gas, and transportation industries. Much has been done, and much has yet to be done. Cultivating market forces somewhat more rapidly may reduce the control the government must maintain over the economy. Certainly, streamlining the government approval process and encouraging market forces in particular areas makes sense. Encouraging a larger spread of markets will reduce the burden on the government, especially at a time when policymakers are challenged with a simultaneous economic slowdown and economic restructuring.